Space engineering is an old business. Sputnik wowed the world over fifty years ago, although the Soviet Union which launched it doesn’t exist anymore. The Hubble Space Telescope has its 20th birthday in 2010. The International Space Station began construction 12 years ago and is due for completion this year. After the US and France, in 1967, Australia was the fourth country to launch its own earth-orbiting satellite. But the intervening forty years have been ones of mixed fortune for Australians with an interest in space. With the establishment of the Australian government’s new Space Policy Unit, however, space engineering in Australia has entered a new era. It is now time for Australia to engage more fully with what a space capability would deliver for this country. At a time when the US is imagining a citizen on Mars, when China and India imagine citizens on the moon, when Virgin Galactic is imagining its craft taking tourists into space, this is a good time for Australia to re-imagine itself and its own contribution to space engineering. 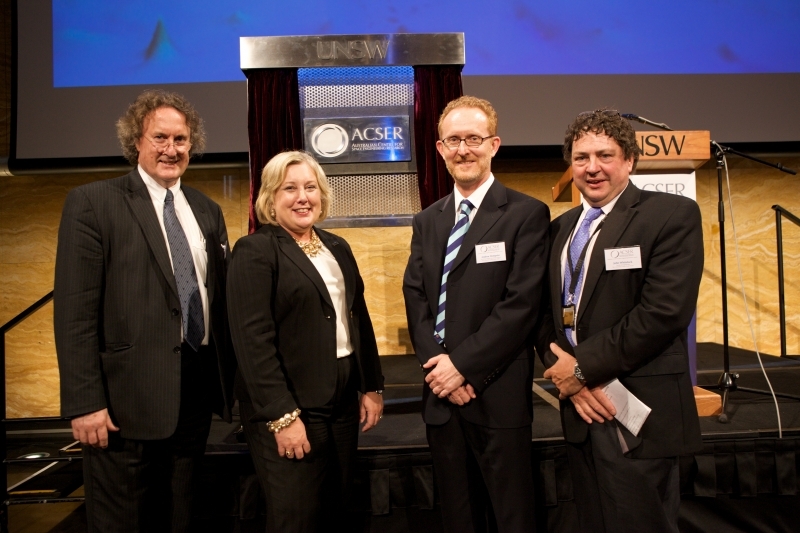 The Australian Centre for Space Engineering Research (ACSER) was launched at the University of New South Wales on the 22nd November 2010 by former astronaut Dr. Jan Davis (photos). ACSER aims to provide national leadership for Australian space engineering research. ACSER strives to foster collaborations between researchers, industry and government and to nurture links between our national and international partners to achieve Australia's space ambitions. ACSER's purpose is to develop space capabilities relevant to Australia's needs through research, innovation and education. The centre draws on the huge expertise of Australia’s largest Engineering faculty. ACSER resides in the School of Electrical and Telecommunications Engineering in the Faculty of Engineering at UNSW and interacts with most of the Schools in that Faculty: Mining Engineering, Mechanical and Manufacturing Engineering, Computer Science and Engineering, Civil and Environmental Engineering, as well as the Engineering and Information Technology School of UNSW Canberra. Collaborations have been developed with the Faculties of Science, Business, Law, and Arts and Social Sciences. Future opportunities are being examined with Photovoltaic and Renewable Energy Engineering and Chemical Engineering. ACSER has research strengths in Global Navigation Satellite Systems receiver design, Earth Observation satellite systems, cubesat development in radiation tolerant FPGA's, Novel satellite structures utilising rapid manufacture and GNSS remote observation research. Through regular forums, workshops and seminars on a range of space-related topics ACSER tries to engage the interest of the wider space community. These events help bring everyone who is working on similar space related research and activity together to encourage future collaborations and strengthen Australia's place in space. ACSER offers a wide variety of PhD topics for students looking to do further research in space. We also offer a comprehensive two-year Master program that prepare graduates with industry experience for Australia's developing space industry. The centre has also established a new satellite navigation testing centre, a new scheme for students to build and launch satellites, as well as pursuing important research in space instrumentation and vehicles. ACSER is also a proud founding member of Delta-V - Australia's first Space Start-Up Accelerator: working to build a commercial Space ecosystem - bringing startups, customers, and investors together.